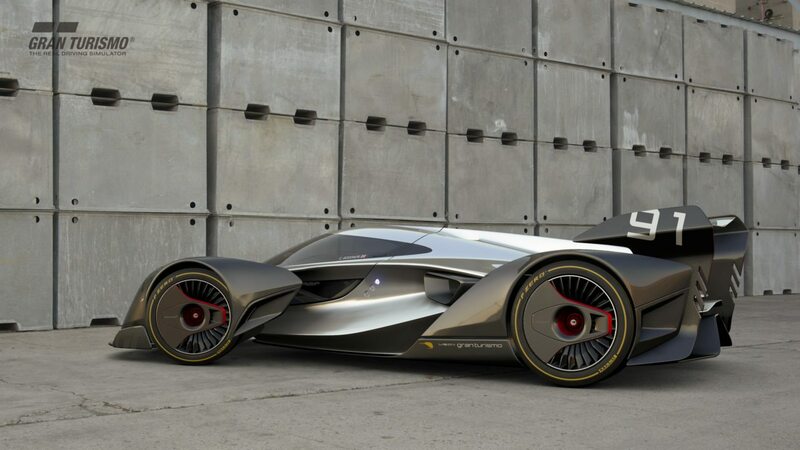 McLaren Automotive has revealed an extreme GT racing car called the Ultimate Vision Gran Turismo. As the name suggests, this car was designed and created for the upcoming video game Gran Turismo Sport (releasing on October 17, 2017). The creator of the game, Kazunori Yamauchi, was looking for “visionary GT cars” for the new game and the Ultimate Vision Gran Turismo (I’m just going to call it the UVGT for short) fits the bill. Power for the McLaren UVGT’s wheels comes from a twin-turbo 4.0-liter V8 engine that works in cooperation with strategically placed electric motors. The combined output is rated 1,134 horsepower and 940 lb-ft of torque. Power for the rear wheels comes from the V8 engine, while the front wheels utilize high-output electric motors housed in the front “wheel pods,” as McLaren calls them. With those numbers, even the P1 can’t compete. To make the car even more extreme, it only weighs 2,205 lbs. McLaren is not planning on bringing the UVGT to production, but seeing a real-life concept version of the car at an upcoming motor show wouldn’t surprise me.